Morgan, a 17-year-old Navajo in Arizona, is learning Dine, the language of Navajo Native Americans. Navajos are trying to preserve their native tongue. Today, Sylvia Jackson is a Navajo language instructor in the small town of Holbrook, Arizona. She teaches Navajo to students at Holbrook High School. Her class is taught entirely in Diné, the Navajo language. During the 1800s, increasing numbers of European settlers in America moved west. In 1864, the federal government began a campaign to deport Navajos from their lands. The natives were moved to the northwest in a series of marches called the "Long Walk." The marches took place under the threat of death. But there is a growing worry that the Navajo language could disappear. Seventy years ago, nearly everyone on the Navajo reservation spoke Navajo as their first language. But today, few young Navajos can speak the language of their grandparents. A study in 1998 found that only 30 percent of Navajos entering school spoke Navajo as their mother tongue. Just 30 years earlier, that was true of 90 percent of first-grade Navajo students. Richard Epstein is a linguist and professor at Rutgers University in Camden, New Jersey. He said a language’s survival depends on one generation passing down knowledge to the next generation. Dr. Epstein calls teaching and transmitting your native language to your children a right that should be better protected. “Everybody should have the right to speak their own language, just as much as they should have the right to practice their religion. Because their language is as good as everybody else’s language…So if you take that away, you’ve taken away a massive resource for knowing something about a part of human life. On the reservation itself, Navajo language instruction in schools starts at a young age. At Indian Wells Elementary School, 3rd graders are learning how to read, write, and speak Navajo. The school opened in 2001. Dr. Robbie Koerperich was Indian Wells’ first principal. Now, he is the superintendent of the Holbrook Unified School District. He said his district is concerned with preserving the Navajo language. Hortensia is a third-grader at Indian Wells Elementary. She said Navajo language is her favorite class. Hortensia said she often visits her grandmother, or naali in Navajo. Grandparents on the reservation play an important part in passing down both the language and culture to their grandchildren. Morgan is a Navajo language student at Holbrook High School. She is one of Sylvia Jackson’s students. She visits her grandparents’ home with her cousins, nieces and nephews. She said she sometimes feels like an outcast. 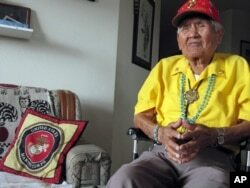 Chester Nez talking about his time as a Navajo Code Talker in World War II at his home in Albuquerque, New Mexico. Some of these students’ grandparents and great-grandparents may also have played an important part in U.S. history. During World War II, the U.S. military recruited Navajo speakers. Together, they developed a code to send secret information past Japanese and German code-breakers. Dr. Epstein credits the Navajo language’s complex structure for it being such a successful code. Sylvia Jackson was once one of those children. Today, she finds herself at the forefront of keeping her language alive. Ashley Thompson and Adam Brock wrote this story. Caty Weaver and Jill Robbins were the editors.